Some of the confirmed buyers expected include the Milan based Camera Buyer Moda who runs over 120 shops in Europe. Also expected is the Sak Brand Group which is one of the largest accessory companies in the United States. It has outlets in 4,500 departmental stores in the United States and is sold across the globe in 24 international markets. Some of its outlets includes Macy’s, Bloomingdale’s, Belk, Neiman, JC Penny, Sears, Nordstrom, Jaks Fifth Avenue etc. Also attending is the Australian based TCF Global Group. They have some of the biggest marketing networks in Asia like China, Indonisia, Thailand, the Phillipines and around the world. As at press time, more buyers are still confirming their attendance. 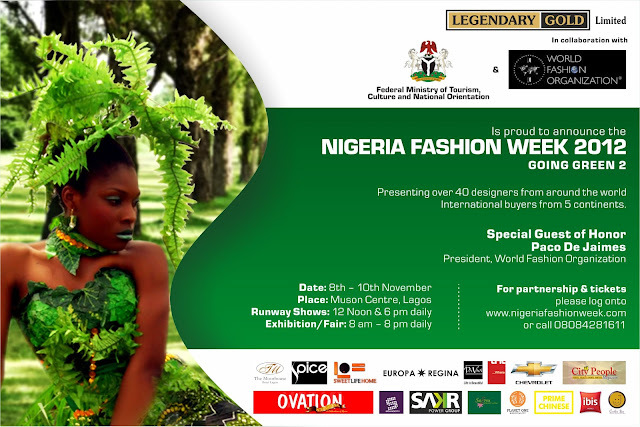 The Nigeria Fashion Week 2012 will be presenting over 40 designers from around the world on 2 daily shows for 3 days. It will run daily exhibitions from 8 am – 8 pm. Some of the designersshowing their collection include Frank Osodi, Mai Atafo, Adebayo Jones, Francesco D’Amico from Milan, Kosibah Creation, Zizi Cardow etc. Some of the Partners of the Nigeria Fashion Week 2012 include; Next Generation Luxury, Chevrolet cars (represented by CFAO in Nigeria), M Gallery Hotel (the Moorhouse), Prime Chinese restaurant, Ibis Hotel, Da Viva, Ovation International, Make Me Beauty Place, City People magazines, Sweet Home Suites, Planet One Hospitality, Saffron restaurant, Sakr Power Group, Cookie jar, Carthago Limited, Villa Picassa, Distell Limited, Rossonero (jewelry &watches) Millare Fashion and Rhapsody’s (bar lounge).